Oops – I have been very lax about updating, lately! This is a problem because I tend to forget a lot of things and when I eventually sit down to write, my mind goes blank and all I can think to say is “my mule is awesome and I love him”. Which is true and an entirely reasonable thing to post, but you maybe don’t need to hear that on a daily basis. 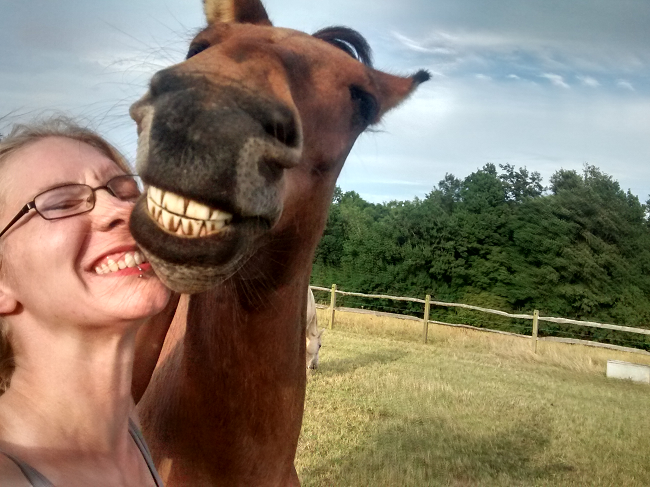 However … my mule is awesome and I love him. This is the most accurate representation of us. A few weeks ago Marty and I had a visit from Suzanne Rogers, an animal behaviourist. I’d seen her name mentioned a lot on local horse forums, with people writing warmly about how much she’d helped their horse and recommending her to others. However, I didn’t think to get in touch with her myself until I discovered that she’d managed the working equine projects for the World Society for the Protection of Animals (WSPA) and therefore had a lot of experience with mules and donkeys. Exactly the person I needed! I had been wary about introducing someone else into our work with Marty, because I was concerned that flip-flopping between too many different techniques may hinder our progress rather than help it; I feel I may have done too much of that already, in an attempt to find something that works. That’s not necessarily a bad thing, as I am of the firm belief that every equine is an individual and you have to find what works for them – but on the other hand, mules do like consistency and I didn’t know whether to keep persisting with the same methods in the hope that we’d eventually figure things out, or cast around for something else. 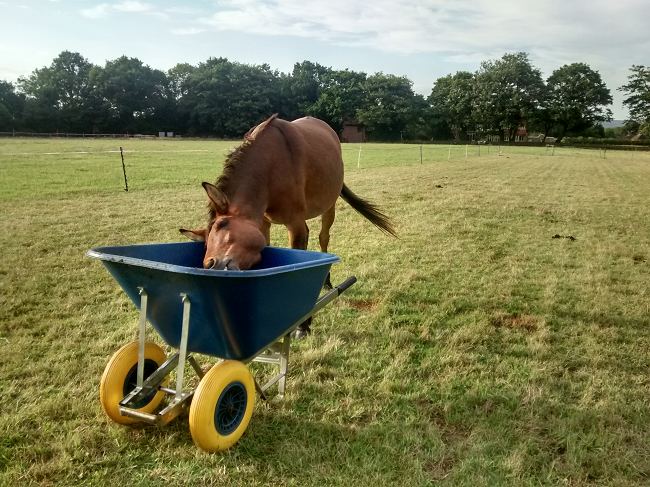 Marty has discovered that the barrow is an excellent source of scratchies for when I’m too busy poo-picking. The work Ben had been doing with him made some definite improvements but it’s a cold fact that, after 14 months of working with him, we really haven’t got that far – or rather, not as far as I had originally hoped. 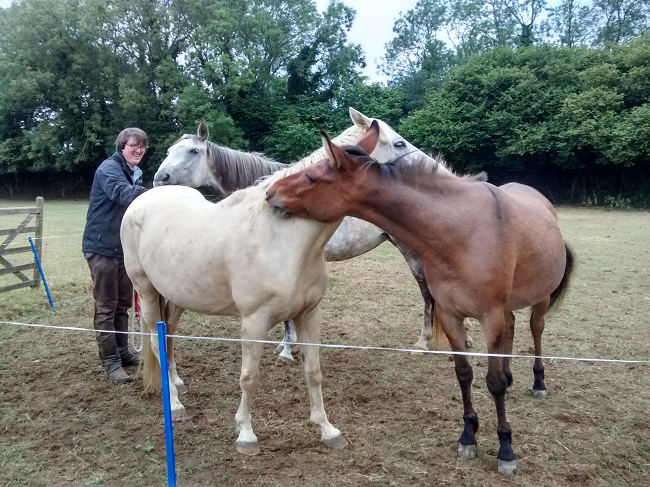 For example, we’ve been sacking out – touching him all over with ropes, flags, blankets, saddle cloths – pretty much since we got him, and he is still tense and anxious. He is able to tolerate more, is less likely to choose a high-speed retreat as an answer and can appear outwardly fine at first glance, but I would really like to be able to do things like touch him without seeing his mouth tighten or his breathing change. 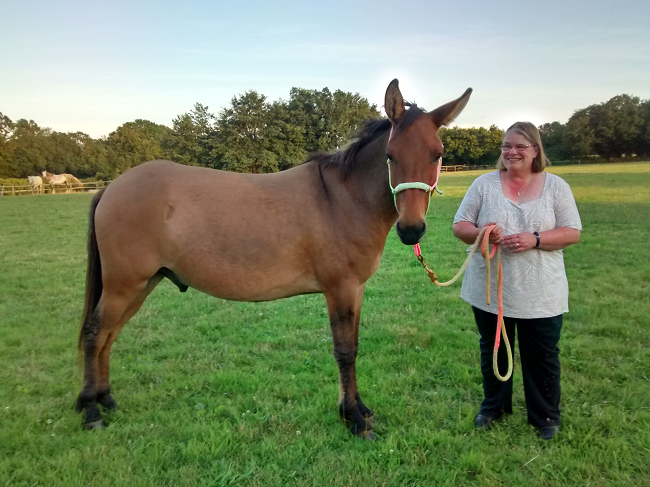 I figured that Suzanne, with her experience, would be able to give us insight into the mind of a mule and help us understand where we were going wrong and what we could do to improve. Even if she said that it was going to take another 14 months before I could put a saddle pad on without him getting worried, that would at least be something! 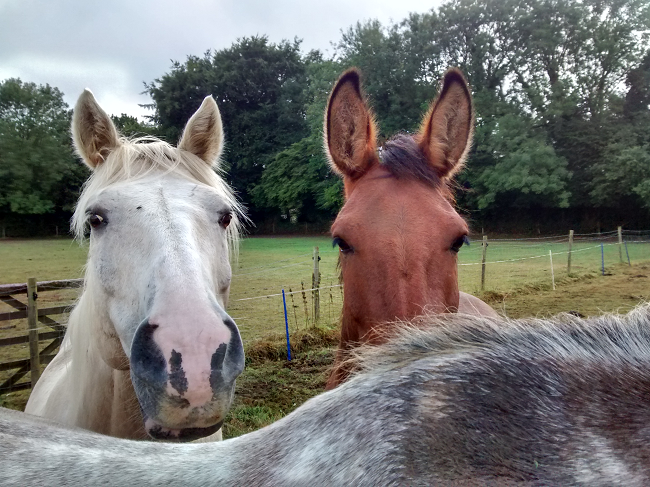 I’m the sort of person who likes to have definite answers to questions, which I’m aware is a terrible trait in horse or mulemanship – it’s detrimental to put a time frame on something. But I often worry with Marty that I might be stumbling along blind, and perhaps following the wrong path. I don’t mind taking a year or more to get somewhere, so long as I know that I’m headed in the right direction. After meeting Marty and finding out a little about him and us, Suzanne laid out a selection of objects in the arena to assess how he reacted to unusual stimuli. The aim was not to make him ‘do’ anything, but just to see how he responded. Marty was his usual curious self and needed no coaxing to approach any of the objects, although sometimes after checking one out he would move to hide behind me. Suzanne noted that we clearly had a good relationship so I was pretty pleased to hear that. The most interesting thing about this little session was that Marty was more concerned by the saddle sitting on the arena gate – a familiar object in it’s usual place – than any of the foreign objects that Suzanne had brought with her. It was there because we had intended to use it, but after seeing how concerned Marty was Suzanne said that we should not be attempting to saddle him until it has returned to being a neutral object. 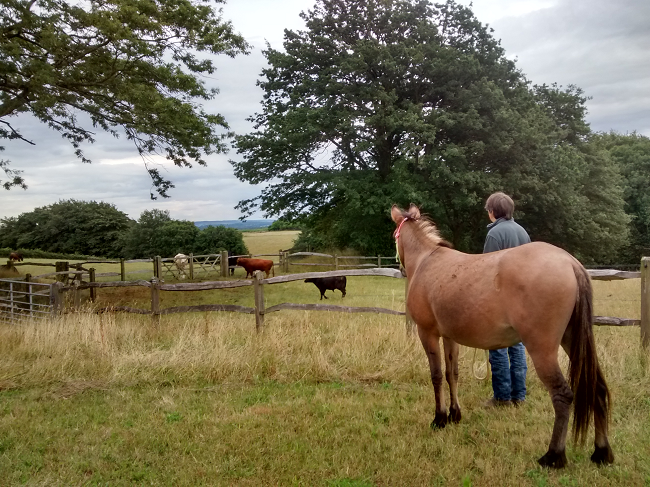 Mules are much quicker than horses at picking up sequential thinking, and Marty knows that the saddle on the gate means that he will eventually wear it. So rather than becoming anxious when it is put on, he is already alert before it’s even picked up – the mere sight of it is enough to trigger a response. It sounds so obvious to me now: why on earth would we try to put something on him when he wasn’t even happy about it being in the same area as him? I had thought that, if we just took small, sympathetic steps (blanket on, blanket off; saddle touching, saddle gone; saddle on, saddle off; girth on, girth off), he would eventually realise it wasn’t going to hurt him and would become more accepting of the process. Unfortunately, that’s not how it works with mules! Checking out the Dexter cattle next door. Marty is much better with cows these days, but these ones were extremely tiny and therefore different – also, the bull kept running around and making weird hooting noises! So for now, the saddle comes out when we work but it does nothing more than sit on the arena gate. Sometimes I bring it down to the field and leave it on the side while I poo-pick. Not until Marty is completely comfortable with it being visible can we progress to the next stage. This is a method known as shaping, and it is what Suzanne has suggested I try with Marty. Quoting from Wikipedia, shaping is where “the form of an existing response is gradually changed across successive trials towards a desired target behavior by rewarding exact segments of behavior”. This is something you can use to train all animals and even people; apparently it has been a very successful approach in weight loss and helping to quit smoking. I’ve downloaded the shaping plan for Confidence, Trust and Problem Solving from Ben Hart‘s website, and Marty and I are steadily working our way through that. It was by no means a cheap purchase but I am finding it very useful as an introduction to a method that, until Suzanne mentioned it, I knew nothing about. A moment of clarity for me was when Marty and I moved on to a step that involved walking over a rope on the ground. Marty wasn’t anxious about it, but he was wary. Previously, my method would have gone like this: walk him past and around the object he is unsure of so that he can see it from all angles, then lead him up to it. If he doesn’t step on or over it, I would maintain the tension on the leadrope and wait for him to figure out the answer. I would not make him go forward but driving him, but I would make the response that I wanted the easiest option for him to choose. If he tried to go sideways and around the object, I would create a barrier with my energy. This time, however, if Marty decided to join me on the other side by walking around the leadrope – which he did – I allowed him to do so. Suzanne had said that this response showed he was still unsure of the object, and needed more time to inspect it from every angle. This felt quite weird to me at first, because I am ashamed to say that I still have vestiges of the old belief that not making a horse do something means you are “letting him get away with it” knocking around in the back of my mind. But I wanted to learn and I wanted to be better, so I ignored that little voice of tradition and just gave it a go. And yes – after a couple of orbits, Marty very calmly stepped over the rope. But what really hit me was the ‘feeling’ that I got from him (yes, sorry, I’m being mystical again). I just had a very strong sense of contentment and understanding; I had listened to him, I had given him more time, and he was happy. Marty looking very handsome and standing very nicely for my mum, who came to visit him this weekend. This sense of contentment has persisted, and he has been extremely mellow in our sessions together. We are having a good time exploring this slower, but more comprehensive, way of working.